GOKPOP | Exclusive K-News in Malaysia & Singapore: Red Velvet Mini Album Event SOLD OUT in 20 Minutes! Universal Music Malaysia Announces A Second Fan Signing Event! Red Velvet Mini Album Event SOLD OUT in 20 Minutes! Universal Music Malaysia Announces A Second Fan Signing Event! SM Entertainment’s girl group Red Velvet announced last week that they will be making their way to Kuala Lumpur for the very first time. Early Bird ticket sales for the Red Velvet <Rookie> Mini Album Event started on 29th March 2017 via the Peatix website, and were sold out within 20 minutes! The regular ticket sales commenced the following day via CD RAMA, and all tickets were also sold out within 24 hours. As a response to the overwhelming ticket sales, Universal Music Malaysia will be organizing a second event for fans of Red Velvet to see their favorite girl group in person! 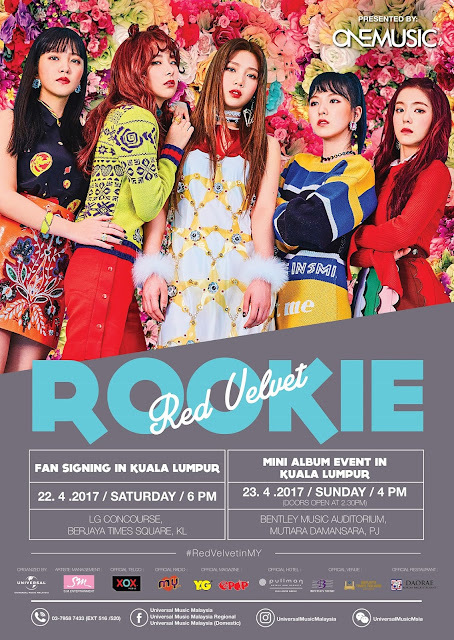 The Red Velvet <Rookie> Fan Signing Event will take place at 6.00pm on 22nd April 2017 (Saturday) at the LG Concourse of Berjaya Times Square. The fan signing event is open for public viewing, but only 200 lucky fans will get their albums autographed at the event. Fans who would like to get their albums personally autographed by Red Velvet will need to redeem an Autograph Pass from 11th April 2017 onwards, while stock lasts. To qualify for the Autograph Pass redemption, fans will need to purchase the Red Velvet <Rookie> album from selected CD RAMA outlets, and then proceed to submit their details and proof of purchase at the following link <https://lnk.to/rvfansigning> before 17th April 2017. 200 lucky fans will be selected to redeem the Autograph Pass. Unfortunately, due to the conflict of Joy’s drama filming schedule, she will not be able to make it for Red Velvet <Rookie> Promotional tour in Malaysia this time round. From 10th of April 2017 onwards, all the videos submitted for Red Velvet Dance Cover Competition will be uploaded on the Universal Music Malaysia Regional Facebook page for public voting. The voting will end on 16 April 2017, by 11.59pm. The video with the highest number of likes will advance to perform in front of Red Velvet. The group will be given professional comments from Red Velvet as well as a chance to take a group photo with them. For further information, stay tuned to the Universal Music Malaysia Regional Facebook page (www.facebook.com/UMMRegional/) or dial 03-79587433 (Ext: 515/516).